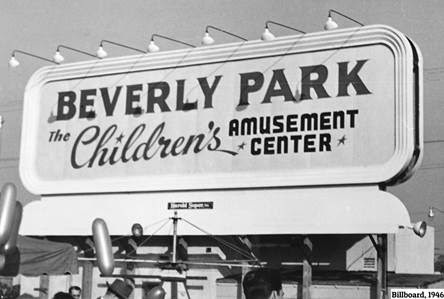 Remember Beverly Park? Well, you’ll have to be of a certain age to do that. It was open from 1943 to 1974 at the corner of Beverly and La Cienega boulevards, where the Beverly Center is now. It was not just your ordinary park. Beverly Park “was best known for its canopied birthday parties, it was equally as popular for the park’s celebrity sightings and then-entertaining thrill rides including a Ferris wheel, merry-go-round, roller coaster, and boat rides,” says the City of West Hollywood, which is commemorating the park with a book event and reception that will take place tomorrow (Tuesday) at West Hollywood Library. It also was an inspiration for Walt Disney. The event, which begins at 7 p.m., will be in the West Hollywood Library Community Meeting Room at 625 N. San Vicente Blvd. Admission is free. The event is part of the city’s WeHo Reads literary series and will feature a talk by author Jennings from 7 p.m. to 8 p.m., followed by a book signing and exhibition reception. The “Remembering Beverly Park” exhibit will be on view on the first floor of the West Hollywood Library through February 2020during regular library operating hours —11 a.m. to 7 p.m. Monday through Thursday; 10 a.m. to 6 p.m. Friday and Saturday and noon to 4 p.m. on Sundays. The library is closed on holidays. Ah for the days when LA was designed for the enjoyment of the people who lived here, not the whims of developers and people who want to turn it into Manhattan West. There were still pony rides going on there when I moved here in mid-1978.